PLEASE READ THE TERMS AND CONDITIONS IN THIS END USER LICENCE AGREEMENT (AGREEMENT) CAREFULLY. BY USING, COPYING OR INSTALLING THE FONT SOFTWARE THE LICENSEE ACCEPTS ALL OF THE TERMS AND CONDITIONS CONTAINED HEREIN AND AGREES TO ABIDE BY THESE TERMS AND CONDITIONS. THESE TERMS AND CONDITIONS ARE ENFORCEABLE AGAINST THE LICENSEE AND ANY LEGAL ENTITY THAT HAS OBTAINED THE FONT SOFTWARE AND ON WHOSE BEHALF IT IS USED. THE LICENSEE MUST NOT USE OR INSTALL THE FONT SOFTWARE IF THE LICENSEE DOES NOT AGREE TO THESE TERMS AND CONDITIONS. This Agreement is a legal agreement between you (Licensee) (and, if the Licensee is entering into this Agreement on behalf of the Licensee’s employer, the Licensee’s client and/or any other third party and the Licensee is legally and duly authorised to do so, “Licensee” shall also include that person or party) and TEC for the Font Software (both as defined in Clause 1.1 below). “TEC” means collectively The Executive Council (an entity in the Emirate of Dubai, United Arab Emirates established pursuant to Law No. (3) of 2003 and having its principal address at Emirates Towers, Level 38, Sheikh Zayed Road, P.O. Box 72233, Dubai, United Arab Emirates), its successors and assigns. TEC licenses use of the Font Software to the Licensee on the basis of this Agreement free of charge on a no-fee basis. TEC does not sell the Font Software to the Licensee. TEC remains the owner of the Font Software at all times. The Licensee has no rights to the Font Software other than as set forth in this Agreement. All rights not expressly granted in this Agreement are reserved to TEC. (e)to access, download and use the Font Software to (i) create Digital Products or allow a third party to create Digital Products on the Licensee’s behalf; and (ii) embed the Font Software into Digital Products and publish such Digital Products. If the Licensee allows a third party to use the Font Software on the Licensee’s behalf to create Digital Products, the Licensee agrees that (i) such third party will only use the Font Software to create Digital Products on the Licensee’s behalf; (ii) the Licensee will make such third party aware of the terms of this Agreement; (iii) the Licensee will ensure that such third party destroys and deletes all Font Software in its possession and/or control upon completion of their use of the Font Software on the Licensee’s behalf; and (iv) the Licensee shall remain responsible for all acts and omissions of such third party with regards to their use of the Font Software. The Licensee shall embed the Font Software into the Digital Product in a secure manner which does not allow an End User to access the Font Software outside of the Digital Product or permit the extraction or installation of the embedded Font Software. (k) to comply with all applicable technology control or export laws and regulations. 3.2 To the extent that the Font Software may be used to create, reproduce, modify, publish or distribute materials under this Agreement, the Font Software is licensed to the Licensee only for creation, reproduction, modification, publication and distribution of non-copyrighted materials, materials in which the Licensee owns the copyright, or materials the Licensee is authorized or legally permitted to create, reproduce, modify, publish or distribute. 4.1 The Font Software is protected by copyright laws and international copyright treaties, as well as other intellectual property laws and treaties. 4.2 The Licensee acknowledges that all intellectual property rights in the Font Software, its structure, organization, code and related files (include all property rights therein and all copies thereof) throughout the world belong to TEC, that rights in the Font Software are licensed (not sold) to the Licensee strictly under the terms of this Agreement, and that the Licensee has no intellectual property rights in, or to, the Font Software other than the right to use the Font Software in accordance with the terms of this Agreement and all rights not expressly granted to the Licensee under this Agreement are reserved by TEC. 4.3 The use of any trademark or trade names relating to the Font Software and/or TEC does not give the Licensee any rights of ownership in that trademark and all use of any trademark shall inure to the sole benefit of TEC. The Licensee may not change any trademark or trade name designation for the Font Software. Nothing contained herein shall be deemed as granting the Licensee a licence to use any trademark or trade names associated with the Font Software. 4.4 The Licensee agrees not to challenge TEC’s rights in or to the Font Software, or the validity of any intellectual property rights or any other of rights therein or to infringe TEC’s rights therein. 5.1 TO THE EXTENT PERMITTED BY LAW, THE FONT SOFTWARE IS PROVIDED ON AN “AS IS” BASIS WITH “ALL FAULTS” AND “AS AVAILABLE”, WITHOUT ANY REPRESENTATION, CONDITIONS OR WARRANTY OF ANY KIND, EXPRESS OR IMPLIED, INCLUDING BUT NOT LIMITED TO ANY WARRANTIES, CONDITIONS OR REPRESENTATIONS OF MERCHANTABILITY, FITNESS FOR A PARTICULAR PURPOSE, THAT THE LICENSEE’S REQUIREMENTS WILL BE MET, ACCURACY, QUIET ENJOYMENT, INTERFERENCE IN THE LICENSEE’S ENJOYMENT, UNINTERRUPTION, BEING ERROR OR DEFECT FREE, DEFECTS OR ERRORS BEING CORRECTED AND/OR NON-INFRINGEMENT OF INTELLECTUAL PROPERTY RIGHTS, COPYRIGHT, PATENT, TRADEMARK OR ANY OTHER RIGHT. IN ADDITION, TEC DOES NOT MAKE ANY REPRESENTATION, CONDITION OR WARRANTY REGARDING THE USE OR THE RESULTS OF THE USE OF THE FONT SOFTWARE IN TERMS OF CORRECTNESS, ACCURACY, RELIABILITY, CURRENTNESS OR OTHERWISE. SHOULD THE FONT SOFTWARE PROVE DEFECTIVE, THE LICENSEE ASSUMES THE ENTIRE COST OF ALL NECESSARY SERVICING, REPAIR OR CORRECTION. THE FOREGOING EXCLUSIONS MAY NOT BE VALID IN SOME JURISDICTIONS AND SOME JURISDICTIONS DO NOT ALLOW THE EXCLUSION OF IMPLIED WARRANTIES OR LIMITATIONS ON APPLICABLE STATUTORY RIGHTS OF A PERSON OR CONSUMER, SO THE ABOVE EXCLUSIONS AND LIMITATIONS MAY NOT APPLY TO THE LICENSEE. IF THE LICENSEE’S LOCAL LAW DOES NOT ALLOW THE EXCLUSION OF IMPLIED WARRANTIES OR LIMITATIONS ON APPLICABLE STATUTORY RIGHTS, THEN ANY IMPLIED WARRANTIES, GUARANTEES OR CONDITIONS ARE LIMITED AS MUCH AS THE LICENSEE’S LOCAL LAW ALLOWS. 5.2 THE LICENSEE ACKNOWLEDGES THAT THE FONT SOFTWARE HAS NOT BEEN DEVELOPED TO MEET THE LICENSEE’S INDIVIDUAL REQUIREMENTS, AND THAT IT IS THEREFORE THE LICENSEE’S SOLE RESPONSIBILITY TO ENSURE THAT THE FACILITIES AND FUNCTIONS OF THE FONT SOFTWARE AS DESCRIBED BY TEC (IF AT ALL) MEET THE LICENSEE’S REQUIREMENTS. 5.3 TO THE EXTENT PERMITTED BY APPLICABLE LAW (INCLUDING THE LICENSEE’S LOCAL LAWS), TEC DISCLAIMS ALL LIABILITY AND RESPONSIBILITY FOR ANY LOSS, DAMAGES, DAMAGE, COSTS AND EXPENSES, INCLUDING WITHOUT LIMITATION INDIRECT, SPECIAL, CONSEQUENTIAL OR INCIDENTAL DAMAGES, INCLUDING ANY LOST PROFITS OR LOST SAVINGS, LOSS OF GOODWILL, BUSINESS INTERRUPTION, WORK STOPPAGE, LOSS OF DATA, COMPUTER ISSUES, FAILURE, DAMAGE OR MALFUNCTION OR FOR ANY CLAIM BY THE LICENSEE OR ANY THIRD PARTY ARISING FROM OR OUT OF THE USE OR INABILITY TO USE THE FONT SOFTWARE OR FROM OTHER DEALINGS IN THE FONT SOFTWARE, EVEN IF TEC WAS MADE AWARE OF THE POSSIBILITY OF THE SAME AND REGARDLESS OF THE THEORY (INCLUDING CONTRACT, TORT, STRICT LIABILITY, NEGLIGENCE OR OTHERWISE) UPON WHICH SUCH CLAIM IS BASED. THE LICENSEE ACKNOWLEDGES AND AGREES THAT THE LIMITATIONS IN THIS CLAUSE 5 ARE AN ESSENTIAL ELEMENT OF THIS AGREEMENT AND THAT THE FONT SOFTWARE HAS BEEN LICENSED TO THE LICENSEE FREE OF CHARGE ON A NO FEE BASIS. PARTY. THE ENTIRE AND SOLE RISK ARISING OUT OF USE OR PERFORMANCE OF THE FONT SOFTWARE AND THE LICENSEE’S CONTENT REMAINS WITH THE LICENSEE. 5.5 The Licensee is required to take all measures to avoid, mitigate and reduce any loss, damage, damages, costs and expenses it incurs or suffers. 5.6 The Licensee agrees that the Licensee’s breach of any of the terms and conditions in this Agreement may cause irreparable and significant harm to TEC (whether monetary or otherwise). 5.7 The Licensee shall be fully responsible for all use of (and other dealings in) the Font Software by any person who gains access to it pursuant to the terms and conditions of this Agreement, or as a result of any of the Licensee’s acts or omissions in violation or breach of this Agreement. 5.8 The Licensee undertakes to defend, indemnify and hold TEC and TEC’s personnel, representatives and affiliates harmless from and against any claim or action against TEC or TEC’s personnel, representatives and affiliates for the Licensee’s breach, violation or non-compliance with the terms and conditions of this Agreement and the Licensee shall fully indemnify TEC and TEC’s personnel, representatives and affiliates from and against any and all losses, damages, damage, fines, penalties, costs (including reasonable legal fees) and expenses incurred by or awarded against TEC or TEC’s personnel, representatives or affiliates as a result of or in connection the Licensee’s breach, violation or non-compliance. (c) give TEC and TEC’s professional advisers access at reasonable times (on reasonable prior notice) to the Licensee’s premises and the Licensee’s officers, directors, employees, agents, representatives or advisers (if any and as applicable), and to any relevant assets, accounts, documents and records within the Licensee’s power or control, so as to enable TEC and TEC’s professional advisers to examine them and to take copies (at the Licensee’s expense) for the purpose of assessing the Claim. (d) terminate this Agreement immediately by notice to the Licensee. 6.1 TEC shall be entitled to terminate this Agreement at any time on giving the Licensee not less than seven (7) days’ prior notice of termination. 6.2 Without prejudice to TEC’s rights and remedies under applicable law, TEC shall be entitled to terminate this Agreement with immediate effect on notice if the Licensee is in material breach of any of its obligations in this Agreement and either that breach is incapable of remedy or the Licensee has failed to remedy that breach within seven (7) days of receiving notice requiring it to remedy that breach. (c) the Licensee must immediately delete or remove the Font Software from all computer and IT equipment in the Licensee’s possession and immediately destroy or return to TEC (at TEC’s sole option) all copies of the Font Software then in the Licensee’s possession, custody or control and, in the case of destruction, certify to TEC that the Licensee has done so. 6.4 Any termination of this Agreement shall not affect any accrued rights or liabilities of either Party, nor shall it affect the coming into force or the continuance in force of any provision of this Agreement which is expressly or by implication intended to come into force or continue in force on or after expiry or termination of this Agreement. (b) the Licensee irrevocably undertakes to TEC that the Licensee shall fully comply with all of its obligations in this Agreement and all applicable laws. 8.1 If the Licensee wishes to contact TEC it must do so in writing, or if any term in this Agreement requires the Licensee to give TEC notice in writing, the Licensee shall contact TEC by emailing info@dubaifont.com and TEC may confirm receipt of this email by contacting the Licensee in writing, normally by email. If TEC has to contact the Licensee or give the Licensee a notice, TEC may do so by emailing the email address the Licensee has provided to TEC or that has been confirmed to TEC by the Licensee. 8.2 Any notice or document to be provided by the Licensee in connection with this Agreement must be in English or, unless the Parties otherwise agree, be accompanied by a certified English translation, in which case, the English translation prevails unless the document is a statutory document. 8.3 The Licensee may not assign, subcontract, transfer, create a charge over or otherwise dispose of any of its rights or obligations under this Agreement or the Font Software without the prior written approval of TEC. Nothing in this Agreement shall prevent or restrict TEC from assigning, subcontracting, transferring, creating a charge over or otherwise disposing of any of its rights or obligations under this Agreement. Notwithstanding any approval from TEC of any assignment or subcontract arrangement entered into by the Licensee in respect of this Agreement, the Licensee shall nonetheless continue to be liable for the performance of all obligations stipulated in this Agreement. The Licensee irrevocably and unconditionally accepts all liability for the acts and omissions of any of its employees, agents, representatives and subcontractors (including their respective personnel, representatives and agents, in each case, as applicable) as if they were the acts and omissions of the Licensee. 8.4 The Licensee undertakes to maintain and keep up-to-date records of its use of the Font Software and shall, at TEC’s reasonable request, make them available for audit, verification and/or investigation purposes as required by TEC no later than seven (7) days from the date of request. Any cost on the part of the Licensee to comply with such audit shall be borne by the Licensee. 8.5 Nothing contained in this Agreement shall constitute or be deemed to constitute a relationship of an agency, partnership or joint venture between the Parties and neither Party shall have any authority to represent, bind or commit the other Party in any manner or to incur expenditure in the name or for the account of the other Party unless otherwise agreed in writing by that other Party. 8.6 No failure of either Party to exercise and no delay by it in exercising any right, power or remedy in connection with this Agreement shall operate as a waiver of that right, nor shall any single or partial exercise of any right preclude any other or further exercise of that right or the exercise of any other right. The rights provided in this Agreement may be exercised as often as necessary, are cumulative and are not exclusive of any other rights (whether provided by law or otherwise). Any express waiver of any breach of this Agreement shall not be deemed to be a waiver of any subsequent breach. A waiver of any right must be specific and in writing. 8.7 TEC reserves the right, without any liability or responsibility to the Licensee, to modify, update, amend or vary this Agreement without notice to the Licensee and at any time. Modified, updated, amended or varied versions of this Agreement may appear on the Dubai Font website from time to time and the same are effective immediately upon such modification, update, amendment or variation. The Licensee is responsible for regularly reviewing the Dubai Font website and all modified, updated, amended or varied versions of this Agreement that may appear thereon. The Licensee’s continued use of the Font Software following any modifications, updates, amendments or variations to this Agreement will be deemed as acceptance of any such modifications, updates, amendments or variations to this Agreement. If the Licensee does not accept and abide by the terms of this Agreement or any modifications, updates, amendments or variations to it, the Licensee is not entitled to use the Font Software. enforceable substitute provision the effect of which shall be as close as possible to the intended effect of the invalid provision. 8.9 Each Party undertakes, at its own cost, to sign all documents and to do all other acts, which may be necessary to give full effect to this Agreement. 8.10 Except as expressly stated herein, a person who is not a party to this Agreement may not enforce any of its terms. 8.11 This Agreement and the relationship between the Parties shall be solely governed by, and construed in accordance with the laws of the Emirate of Dubai and the applicable federal laws of the United Arab Emirates. 8.12 Each Party unconditionally and irrevocably agrees that the Dubai Courts as established by Law No. 3 of 1992 and Law No. 13 of 2016 (Dubai Courts) shall have the exclusive jurisdiction to settle any dispute, claim, difference or controversy arising out of, relating to or having any connection with this Agreement, including any dispute as to its existence, validity, interpretation, performance, breach or termination or the consequences of its nullity and any dispute relating to any non-contractual obligations arising out of or in connection with it. The Licensee hereby unconditionally and irrevocably renounces any right it may have to challenge in any other jurisdiction or arbitral system the decision of the Dubai Courts. 8.13 The Parties acknowledge and agree that each Party’s entitlement to terminate this Agreement pursuant to Clauses 5.10(d) and 6 are in accordance with the meaning of “consent” and “mutual consent” under the United Arab Emirates Civil Code (Federal Law No. 5 of 1985) including (without limitation) Article 267 of that law, and that a court order will not be required to give effect to any termination of this Agreement under Clauses 5.10(d) and 6. Expression is the way everyone shares their thoughts, ideas, and emotions. Writing is a form of expressing oneself and Dubai is giving the world a new tool to communicate with. The Dubai Font. Designed to unite the world through the power of expression. The Dubai Font is a project commissioned by His Highness, Sheikh Hamdan, and launched by The Executive Council of Dubai in partnership with Microsoft. The font reflects modernity and is inspired by the city. With a font family of 4 weights, it was designed to create harmony between Latin and Arabic. The very form of Dubai Font celebrates the union of heritage and innovation, giving the world access to a new form of high-quality typography. This is the first time that a typeface, created specifically for a city, is integrated with Microsoft and is available for free to all users worldwide. 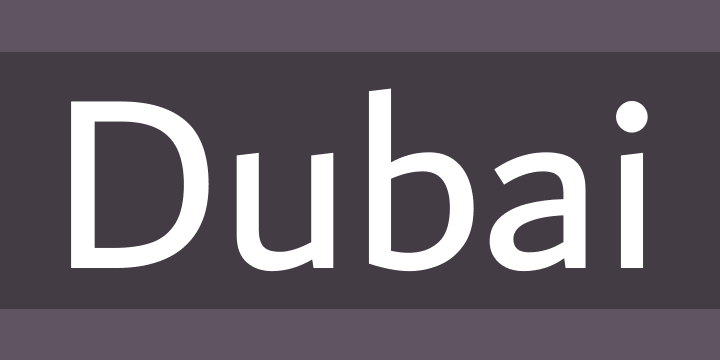 The Dubai Font is more than just a font. It is an embodiment of a vision – one of promoting literacy, unity, and forward-thinking laced with tradition, carrying within it aspirations beyond its outlines. It is young, dynamic, and full of passion and energy. This typeface is designed to ignore barriers and empowers everyone by offering a high-quality design that is optimized for reading on screen and free for use in design, office communication, and even embedding in applications. The font will reach over 85 million in 180 countries worldwide, thanks to Microsoft. The government of Dubai approached Microsoft with the idea of partnering on a new font family, ones that would not only be useful for Office customers, but one that would also fill gaps in the Office font set, and be used worldwide. The Dubai Font was commissioned by the Dubai Executive Council and designed by Monotype’s Dr. Nadine Chahine and its design team. It introduces a new global medium for expression, one driven by compassion and a desire to innovate, strongly in collaboration with Microsoft. Self-expression is an art form. Through it, you share who you are, what you think and how you feel to the world. To do so you need a medium capable of capturing the nuances of everything you have to say. The Dubai Font does exactly that. It is a new global medium for self-expression. By celebrating the past and embracing the future, transcending all barriers, the Dubai Font is the voice of our brave new world.